Steak. The word alone unleashes your inner caveman. We instinctively prize such “upper” cuts as New York strip and tenderloin. True, meat closer to the backbone tends to be flavorful and tender (think filet mignon), which is why they cost top dollar. But as any true steak lover knows, there’s great eating to be found on the steer’s, er, undercarriage. Flank steak. Hanger steak. Skirt steak. Once deemed cuts for the poor, these belly steaks aren’t exactly cheap these days, but they’re a lot less expensive than top cuts. They’re richly endowed with flavor and they have the added benefit of being quick and easy to cook. All steaks should be generously seasoned, grilled over a hot fire, and rested for a few minutes before serving. To sample fibrous belly steaks at their best, cook them fast and serve thinly sliced across the grain (which shortens those tough stringy meat fibers). Here follows 10 great steaks for grilling. My favorite? The one that’s on the end of my fork! Porterhouse: For the person who wants it all—two great steaks in one: a New York strip and a filet mignon (see below), connected by a T-shaped bone. What a combo! Cut from the rear of the short loin, this monster (I like to buy it at least 2 inches thick) serves two people with leftovers. Italians call it bistecca alla fiorentina and grill it dark on the outside and just shy of still bleeding inside, seasoned with little more than sea salt and extra-virgin olive oil. They cut the two steaks off the bone and carve them into 1/4-inch thick slices. (The bone goes back on the grill for charring.) Tip: For a professional-looking presentation, keep the slices in order and reassemble the porterhouse around the bone. Which you, the grill master, call dibs on. T-bone: A slightly smaller version of the porterhouse cut from the front of the short loin. This gives you a smaller piece of filet mignon, but a more tender slab of strip steak. Buy it at least 1 inch thick so you can achieve a dark char on the outside without overcooking the center. Tip: Supermarket T-bones tend to be on the thin side, so buttonhole the butcher and ask him to custom-cut a thicker T-bone for you. Top this steak with a slice of my Planet Barbecue Black Truffle Butter and get ready to hear the angels sing. Try these recipes: Caveman T-Bones with Bell Pepper Hash and Steaks from Hell! Strip steak: The multiplicity of names—New York strip, club steak, Kansas City steak, shell steak—attests to the popularity of this steak. Tender (but not too tender); well-marbled (i.e., generously endowed with fat); and richly flavored—what more could you ask for in a steak? Not that you asked, but a center cut New York strip is Steven Raichlen’s favorite cut. Tip: Sometimes you’ll find supermarket strip steaks labeled “first cut.” This makes them sound more exclusive, but actually the “first cut” has a visible line of gristle running through the meat. That’s why “first cut” strips cost about half the price of the more desirable center cuts of the short loin. Try this recipe: Tamari-Glazed Steak with Sweet-and-Spicy Rice! Filet mignon: Cut from the tenderloin (a long cylindrical muscle that rides under the ribcage next to the backbone, and hence receives very little exercise), this puck-shaped steak is the priciest per pound. Very tender, but not super flavorful because it’s so lean. (Remember the great steak equation: fat = flavor.) Tip: The lack of marbling is why you often see filet mignon wrapped with bacon, topped with foie gras or truffle butter, or served with egg-rich béarnaise sauce or a cream-based peppercorn sauce. Rib steak/rib eye: If the rib eye came from a sheep, it would be a lamb chop. (A very big lamb chop.) Which is to say a tender, juicy, super-well marbled steak with rib bone still attached (which the Good Lord meant for you to pick up and gnaw). Rib steaks are cut from the upper ribcage. Some butchers sell them as “cowboy steaks”—thick-cut rib steaks with massive bones that tip the scale at a belt-loosening 2 pounds or more. Remove the bone (save it for smoking) and you get a more manageably sized steak called a rib eye. Look for streaky fat distribution throughout, and avoid steaks that have a large lump of fat between the cap and the eye. Tip: To ensure a perfect char on the outside and a reddish-pink interior, start searing this big hunk o’ meat—or any steak that’s more than 1-1/2 inches thick—over high direct heat, then finish cooking over medium or using indirect heat. Sirloin steak: Talk about confusion: the term “sirloin” can refer to one of eleven different steaks, from the highly desirable strip steak (see #3 above) to cuts best enjoyed ground up as hamburgers. “Top sirloin” is more tender and desirable than “bottom sirloin.” Both are intensely flavorful, but a bit tougher than the previous steaks. Tip: slice a top sirloin crosswise on the diagonal for serving, which maximizes the tenderness. And of course, serve with sharp steak knives. Flat iron: The new darling of American grill masters is #1114D in the National American Meat Processor meat buyers’ guide—better known as the flat iron. Second only to filet mignon in tenderness according to scientists at the University of Nebraska, this well-marbled steak cut from the steer’s shoulder makes for great grilling whether marinated or seasoned simply with coarse salt and pepper. Tip: The flat iron isn’t as widely available as other steaks, so you may want to order it ahead. 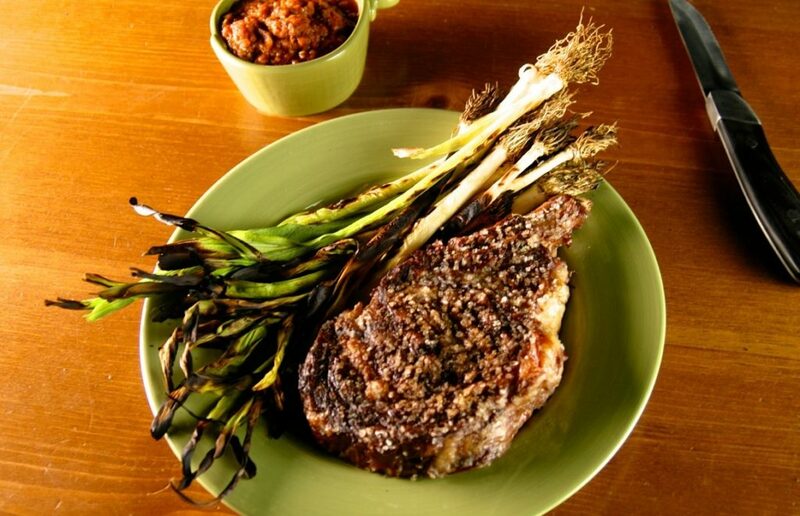 Try this recipe: Tex-Mex Flatiron Steaks Con Mucha Cerveza! Flank steak: You might reasonably assume that flank steak comes from the…well, the steer’s flank. Actually it comes from the abdomen—hence its fibrous texture and robust beefy taste. (Cows have abs, too.) Flank is the traditional steak used for London broil and there are two secrets to grilling it right every time. First, cook it over a high heat and never beyond medium rare. Second, let it rest a couple minutes before serving and slice it paper thin on the diagonal across the grain. (This shortens those tough meat fibers.) Tip: Lightly score the top and bottom of a flank steak (cut a shallow crosshatch pattern into) before marinating and grilling. This speeds up the absorption of the marinade and keeps the steak from curling. Try this recipe: Filipino-Style London Broil! Skirt steak: If you’ve ever had fajitas, you’ve eaten skirt steak—a long, slender fibrous cut whose Spanish name (fajita) literally means “girdle.” It’s no longer cheap, but it’s still a relative bargain, delivering a rich beefy flavor and satisfying chew. (There’s nothing wrong with a steak with a little chew—that’s why God gave you teeth.) Another advantage: it’s quick cooking, requiring a mere 2 to 4 minutes per side on the grill. As with all belly steaks, grill over high heat and always slice thinly on a diagonal. Tip: For maximum wow power, ask your butcher for a whole skirt steak, which measure 16 to 18 inches in length. Talk about a steak that literally buries the plate! Try these recipes: Romanian Garlic Skirt Steak and Cumin Marinated Skirt Steak! Hanger steak: Traditionally, this is the cut butchers kept for themselves. Anatomically speaking, it hangs from the diaphragm near the kidney, which makes it uncommonly aromatic (and gives it the name “hanger”). Thicker, a little tougher, and more fibrous than skirt steak, hanger steak needs high heat, quick cooking, and slicing across the grain. Tip: The French call it onglet and serve it with red wine or mustard sauce. Try this recipe: Hanger Steak with Wine Merchant Sauce! So now that you know which steak to buy, learn the 10 secrets of grilling steak to master cooking it. TRY THESE BEST OF BARBECUE PRODUCTS WITH YOUR STEAKS!